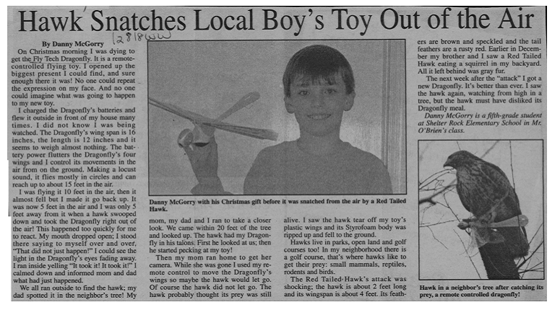 So, out on Long Island some kid’s FlyTech Dragonfly was snatched out of the air by a hawk that mistook it for actual prey. Either the hawk is really stupid and/or blind or WowWee’s flying robot is the technological marvel they claim it to be. I’ve seen it in action multiple times and for anything to fly that isn’t meant to fly, it’s pretty impresive. After investigating the story below from a local Long Island newspaper, WowWee’s Customer Service Department determined that it has received 45 different calls over the past 2 months about hawks and other bird of prey swooping down and snatching consumers’ FlyTech Dragonfly out of the air. I’m told they’re trying to get video of this phenomenon. I hope they do.